Do you have a traditional Christmas breakfast? At my house growing up it was eggs and fried potatoes. My husbands family has Welsh Rarebit every Christmas. This year will be our first Christmas away from family and time to start our own Christmas breakfast tradition, so I am looking for something fun to make. Unfortunately my son won't like these mini quiche with hasbrown crust because he hates eggs, but that doesn't mean they won't make an appearance at some breakfast in the near future. I am thinking these would be fun for breakfast in bed on Mother's Day. I just need to remember them come May. 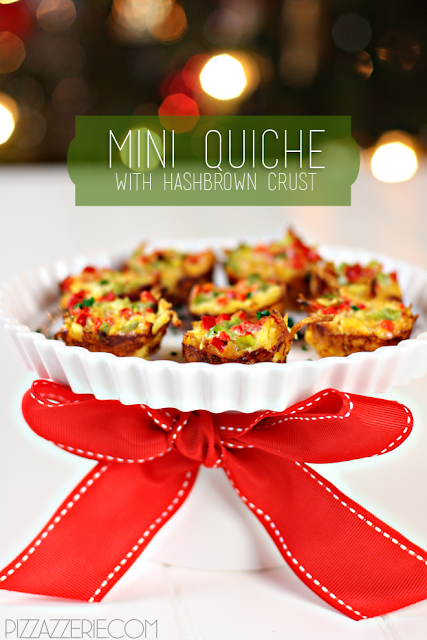 You can get the recipe for these yummy looking hasbrown crust mini quiches over at Pizzazzerie.